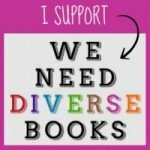 Activity Book, Activity Book, Ages 6-8, Ages 9-12, Children's Book Reviews, Coloring & Activity Book, Education & Reference, Europe, Explore the World, Foreign Travel, Geography & Cultures, Juvenile Nonfiction, London, North America, People & Places, Transportation, Travel, U.S.A.
for added fun during any upcoming travel plans. 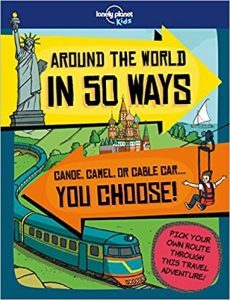 A clever travel maze of sorts, Around the World in 50 Ways is designed as a “choose-your-own travel adventure” where readers set off from London and try their hand at globetrotting with the goal of finishing up again in London. So much depends on what mode of transport or next destination is selected as to whether they’ll navigate the winning route the first time around. There are myriad means of travel and a plethora of possible routes, but beware of dead ends! Not to worry though because, like any good maze, readers just return to the beginning or the place where they ventured off incorrectly and try again. 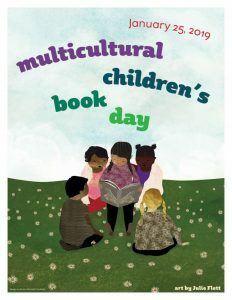 Along the way, kids will learn about some of the world’s most popular, exotic and interesting places while picking up fascinating facts—did you know Dhaka is the capital of Bangladesh or that Hanoi in Vietnam is sometimes called “The Paris of the East”?—and enjoying bright and bold illustrations. From Bangkok, Barcelona, Battambang, Berlin, Brussels, Budapest and Buenos Aires all the way to Tokyo, Toronto, Trondheim, Vancouver, Venice, Victoria, Wellington and Wuppertal with tons of exciting destinations in-between, there’s tons to see and do (164 pages worth to be precise). How to get from point A to point B? Try a bus, a cruise, a rental car, a ferry, a felucca, a tuk-tuk, a canoe, a jumbo jet, a rickshaw, a sled and lots more! Whether going abroad or enjoying a local staycation, fit this book into your itinerary. Click here for a link to cool Lonely Planet quiz. 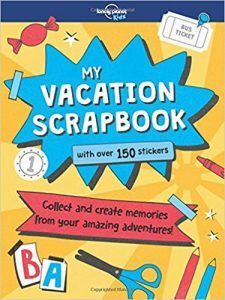 My Vacation Scrapbook (with over 150 stickers) is full of creative activities that will keep kids entertained for hours and also jumpstart their imaginations as you head off on holiday or even on day trips to the zoo, national parks, Disneyland or other theme parks. 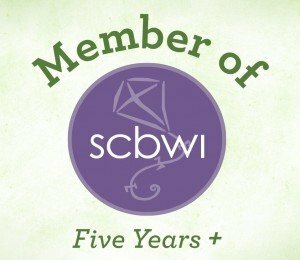 Not only is this scrapbook a great way to help kids experience a vacation from a new perspective, it’s also going to become a unique time capsule of special experiences away from home. One of my favorite activities included in My Vacation Scrapbook is the Bar Code Decode where children can play secret agent by using bar codes from various vacation purchases to track down enemy spies around the world. Included for that is a map with starred cities and numbered coordinates making this an inviting game for the entire family. There’s a two-page spread where readers can glue or tape found objects and turn them into art, there’s a place for snack wrappers (never thought of including those in my scrapbooks! ), a competition involving meal receipts and loads of pages to stick other prized momentous from the trip. Kids will be able to find lots to do with the stickers provided and at the back, there’s even a “handy pocket to collect your souvenirs” like postcards, stamps, receipts and used museum passes and transportation tickets. An elastic band secures all the treasures for future viewing and reminiscing. The assorted 40 pages are thin enough for doing some rubbings of textured items yet sturdy enough to withstand frequent use. This would make a wonderful going away gift when paired with a pack of crayons, tape, glue sticks and scissors (just remember scissors cannot be brought on an airplane). This “fold-out, fact-filled poster” is a map of North America meaning included are Canada’s 13 provinces, America’s 50 states and 21 other countries plus 22 dependencies (territories that are governed by, or make up part of, another country.The range of destinations spans from Antigua and Barbuda to the U.S. Virgin Islands. 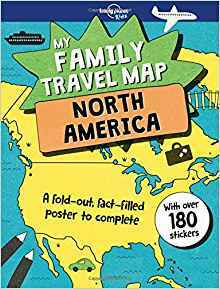 If you’re a fan of geography this is a definite must-have, but even if you are unfamiliar with the map, it’s an interactive, educational and entertaining way to get to know North America. It’s easy to personalize the map with the over 180 stickers that say things like GOING HERE SOON, BEEN HERE!, I LIVE HERE plus hearts, stars, arrows, modes of transportation, sun, rain, clouds and other assorted weather stickers, as well as blank stickers to customize. When you’re done exploring, turn the map over for interesting details about places you’ve traveled to, plan to visit or may have on your “dream destination” list. Bring My Family Travel Map along on any upcoming road trips or play armchair traveler from the comfort of your home. Read our review of First Words French from Lonely Planet Kids.